The best long term improvement you can make for your company is to hire better quality employees. placing an ad on the Internet. Short cuts like temp-to-hire body shops and headhunters can fill your vacancies, but they won't provide top quality recruits. 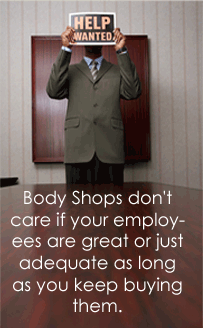 Temp firms and headhunters are in the business of selling you bodies. The best recruiting programs are company programs. After all, it is your future that is at stake.